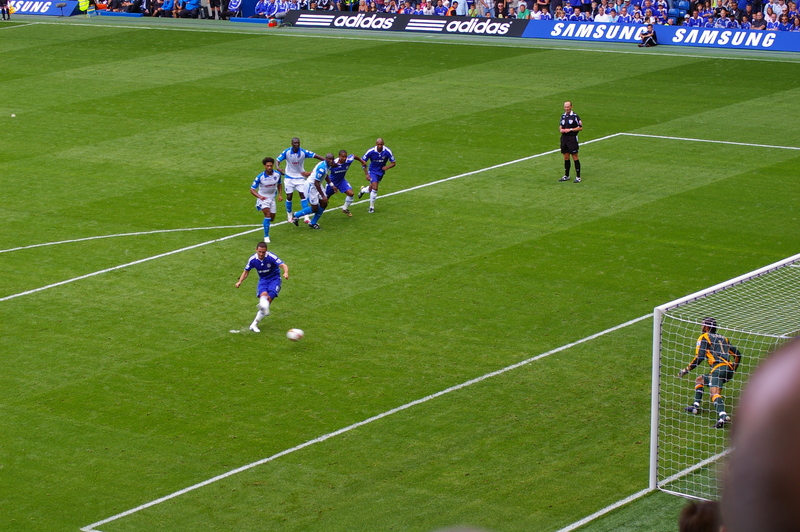 Chelsea vs. Portsmouth : 17 August 2008. So, here we go then, let’s get this baby started. I drove up to London on Saturday afternoon so I could attend Beth’s Birthday Party in the evening. My girlfriend Judy was with me for the weekend and we were staying at a nice hotel on The Strand…the one, in fact, where my parents honeymooned in 1957. Not sure if we will have a full report elsewhere on Beth’s Party, but it was a great time, a perfect start to the new season. The restaurant was good fun…words can’t describe it…lots of gold, lots of mirrors, like a Turkish bordello…ahem, apparently. The etchings in the toilets were rather rude! Judy and myself were sat up in a raised platform with Andy Wray and Mick ( who posts on this site ) and his wife. The food was excellent. We left there at about 11.30pm and popped into a club for a couple more beers. A fine time. I’m sure Beth will update you all in more detail. While staying in the hotel over the weekend, it dawned on me how it’s possible to tell if you are a real, bona fide Chelsea fan. This is the test, this is what matters…when I go away with Chelsea, especially, or stay at a hotel, once I have had a shower, the bathroom tends to get all steamed-up, especially the large mirrors. A true Chelsea fan will look at the mirror and see a blank canvas…I always write “CFC” on the mirror…always, without fail, like I’m marking my territory. This is the test. Who else does this? When I explained this to Judy, she said she had seen me do this before! We had a great breakfast and left the hotel at about 10.30am…a beautiful sunny day, but with a cooling breeze. I looked straight ahead, along The Strand, Nelson’s Column in Trafalgar Square just peeking over the buildings,, a red Routemaster bus was approaching…a classic London scene, maybe one which my parents would have seen in 1957. There was a bounce in my step – I just had a lovely feeling of being in a beautiful city on my way to see Chelsea, just three miles down the road. Just wonderful. We strolled into The Goose at 11.30am. Reg had opened it up early at 10am and would do so again for the Spurs game. Music to our ears. The boys were in the beer garden…Judy and me sat down and we were entertained by my two mates Brian and Paul from Frome, full of cheeky innuendo! The beer garden soon got packed – it was a typical Chelsea scene, dominated by blokes in our forties, receding hairlines, Lacoste polo shirts and lots of jokes and laughter. Had a quick word with Dutch Mick ( Chicago 2006 ) who I last saw in Moscow. I said to the boys that Judy was my good luck charm…she had previously been to six other CFC games with me and had seen six wins. Also of huge importance to our story is that the day after we both met, Chelsea won 6-1 at Tottenham. Bumped into Cathy and Dog outside one of the souvenir stalls along the Fulham Road. A lovely pre-match buzz as we sauntered past The So-Bar. Saw a few people being interviewed by some TV cameras. However, we got to The Shed entrance at 1.15pm and due to teething problems with the new swiping system, we didn’t get in until 1.40pm. There were a few irate fans. For once, I prayed we that we didn’t score! Apparently, Beth got in a bit late, too. Judy and myself were at in The Shed Upper for a change ( Gate 7, SW corner…mmm, just like against Derby in 1983 ) while Beth’s party were right next to the Pompey in Gate 3. OK – you all saw the game. Great, wasn’t it? How nice of Chelsea to wait until we were in the stadium to score the first goal. Just a few comments…I was impressed, firstly by Jose Bosingwa, the new Jose of SW6…athletic and fast, not unlike Ashley Cole to be honest. Top marks. Loved Deco – not just his ball skills and vision, but the fact that he would often put his foot in and wasn’t afraid of the physical side. Our midfield just purred – great ball retention, lovely movement…superb. Yes, Pompey were dire, but we were good you know. In the second-half, I am sure I saw Florent Malouda go on a run and beat a few players, but this just might have been an optical illusion. So, three-up at half-time and I’m dreaming of picking up £125 at Ladbrokes. In the end, Deco’s wonderful strike ( I loved the fact he hardly had any back-lift ) gave us a deserved 4-0 win, but did the players not read my script! Portsmouth – the reigning FA Cup holders, remember – only brought 1,500…poor, I thought…they didn’t sing too much. What else? Thought the stadium looked fantastic…I definitely approve of the new look, the rather “darker-than-normal blue”, colour of the balconies, which have always been festooned with advertising hoardings. It really makes the place look sleeker, cleaner…liked the ultra modern pitch-side adverts too…very high-tech. Did everyone spot the lovely banner on the MHU balcony wall? “JT LEADER,CAPTAIN, LEGEND.” A nice touch…we’re getting a bit like Manchester United now, with their permanent banners at the Stretford End. I approve. Might have to do one myself…sign some Italians and I’ll hoist “VINCI PER NOI” once more! Our support was mixed…some nice singing at times, our section did a few nice “Meadows”…definitely a game of two halves…The Shed won the first, The Matthew Harding the second. There were, though, many periods of complete silence. I know I don’t want to hark on about this, but the 17,000 against Derby in 1983 made more noise! A bloke who was sat next to me, didn’t sing or offer any encouragement the entire. This blog is not dedicated to him. Met up with Beth and her brother Robert outside the Megastore…Clive Walker walked past ( he played against Derby in that game in 1983 ) and I realised how lovely it was for our former players to be involved still. I also spotted Peter Bonetti at the game ( our goalkeeping coach in 1983 ) too. A new thing for this season is a montage on the long wall opposite the West Stand – a succession of images of new and old players has been super-imposed on the wall and fans can have their photos taken by them. Beth posed next to JT ( go figure ) and Judy posed next to Vialli ( who she adored! ). Oh – one thing made me laugh…in the programme ( much the same format to last year ), I saw an advert for a Chelsea toaster…but it spells out “CFC” once the bread has been toasted…mmm, a bit similar to my hotel bathroom antics! We strolled back to The Morrison on the Kings Road, where we met up again with Jenni, Andy, Wobbly and all. Beth and Wobbly spoke to Judy on a few occasions over the weekend about joining me in NYC next summer…watch this space…she is my lucky charm after all! A great start, top of the league – Wigan, you are next. More match reports – from 1983 and 2008 – as the season progresses. This entry was posted in Season 2008-2009. and tagged 1983-1984, 2008-2009, John Terry, London by Chris Axon. Bookmark the permalink.